As a consequence of professing their faith, early Christians were persecuted mostly during the Roman Empire and were often tortured to death for maintaining his or her religious belief. Many deaths were inspirational for other people and increased the fame of the Catholic religion, although several of these stories are unhistorical and are purely legendary. Meet ten of the most excruciating martyrdoms of early Christianity. 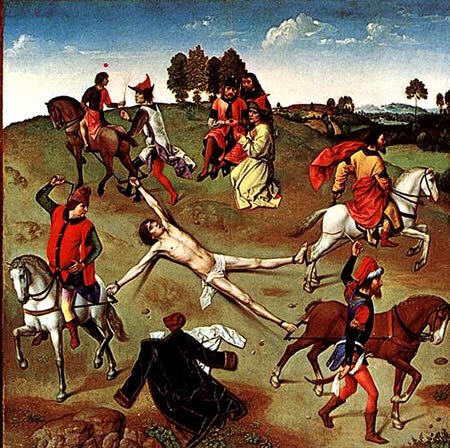 A saint named Hippolytus was martyred in Rome in the third century. He is treated in the Golden Legend, which says he was a soldier who participated in the torture execution of St. Lawrence but converted as a result of that saint's example. He was then sentenced to be torn apart by horses. Ignatius of Antioch, surnamed Theophorus which in Greek means "God-Bearer," was probably a convert and disciple of St. John the Evangelist. Ignatius succeeded Evodius as bishop of Antioch; he retained the office for forty years, proving himself in every way an exemplary pastor. During the Trajan's reign, the Emperor laid down the principle that Christians should be put to death if formally reported, but not otherwise sought out for punishment. The Emperor was a humane man, yet the gratitude which he felt he owed to his own pagan gods for his victories over the Dacians and the Scythians later led him to authorize the death penalty for those Christians who refused to acknowledge these divinities publicly. According to the legend, Trajan ruled that Ignatius should die. 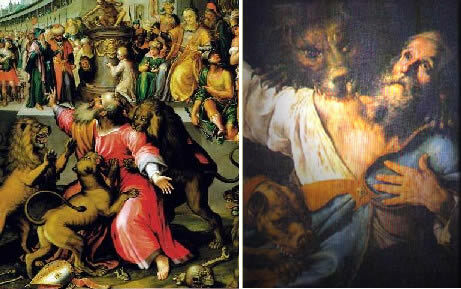 He was bound and conveyed to Rome, to be devoured by wild beasts in the Colosseum. He reached Rome on December 20, the last day of the games, and was brought at once before the prefect, to whom the Emperor's letter was delivered. At the prefect's command, the prisoner was hurried off to the Colosseum, where two fierce lions were let out and Ignatius was at once killed. His feast day is February 1. St. Lawrence was one of seven famous deacons of the early Church. The other six deacons were captured by the Emperor Valerian on August 6, 258, and martyred. The oppression of the Christian Church was very severe, and many Christians fled Rome or died. As librarian and archivist, Lawrence was thought to have a list of all the members of the early Church, and the locations of all the mythical hidden hoards of gold belonging to the Vatican. Captured by the soldiers of the Emperor Valerian, he was told to produce all the wealth of the Church. He was given only two days to bring all the treasures to the imperial palace. Lawrence gathered up all the diseased, orphaned or crippled Christians on the appointed day, brought them to the palace, and told the startled emperor that "These are the treasures of the Church!" According to tradition, for his impudence, Lawrence was slowly roasted on a grill on the site of the Basilica di San Lorenzo in Rome, in the hope that he would publicly renounce his religion and reveal the names of the wealthy Christians. He is often represented holding a gridiron to memorialize this grisly manner of martyrdom. Although St. Lawrence was most certainly beheaded and not roasted, the traditions of his being cooked are somewhat stronger than actual fact. 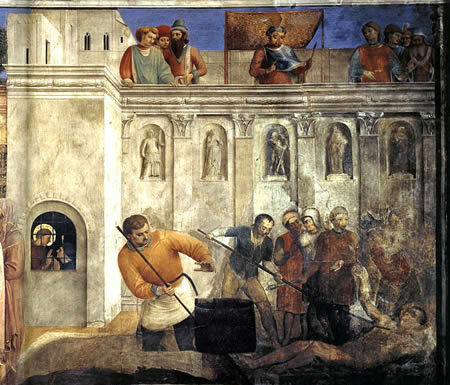 As a result, St. Lawrence is also considered a patron saint for cooks. There is also the popular story that he was so willing to embrace Christ in heaven, that he did not mind the pain from the fire of his martyrdom, and indeed, he found the strength to tell his executioners "Turn me over. I am done on this side." The courage and dignity of St. Lawrence and many of these other early Christians in facing their death did much to gain respect for their religion in Rome, and after the death of St. Lawrence, there was widespread conversion to Christianity. His feast day is August 10th. Patron saint of Guam, St. Agueda is particularly worshiped by married women and those women who are breast feeding their babies. Agatha, daughter of a distinguished family and a girl of great beauty, was pursued by a Senator Quintianus who had fallen in love with her. As his proposals were resolutely spurned by the young girl, he put her in charge of an evil woman, whose efforts at seduction were thwarted by Agatha's commitment to her Christian faith. Quintianus then had her subjected to various cruel tortures. 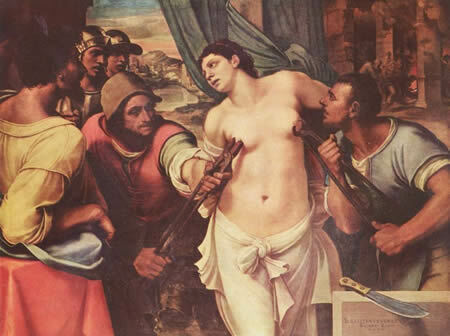 Of these, the most barbaric was an order to have her breasts cut off. This became the peculiar characteristic in medieval images of the saint. However, it was said that Agatha was consoled by a vision of St. Peter, who healed her miraculously. Her scorned admirer eventually sentenced her to death by being burnt at the stake. However, she was saved from this fate by a mysterious earthquake. She later died in prison as a result of the repeated cruelties inflicted on her. Her feast is kept on 5 February and she has been venerated as patron saint of breast cancer patients. One of the 12 Apostles of Jesus, Bartholomew is often identified as the Apostle Nathanael. Little is known of his activities as a disciple other than what is related in the Gospel of John concerning Nathanael's first meeting with Jesus. After the Resurrection, he is traditionally believed to have preached in India and Armenia. Tradition holds that in Armenia he was flayed alive and then crucified upside down for refusing to worship pagan gods. This fate led to him being adopted as the patron saint of tanners. 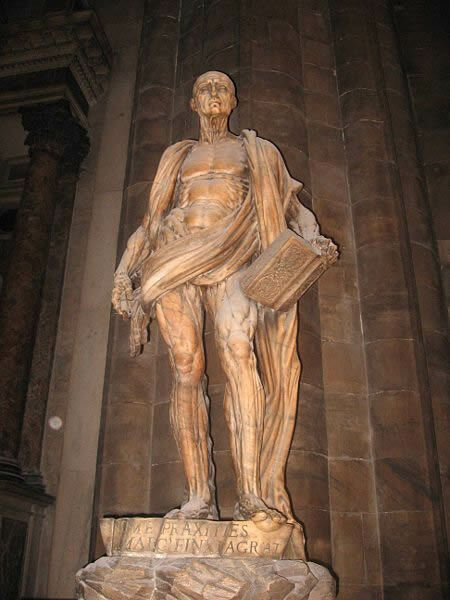 He is represented in Michelangelo's Last Judgment, with his own skin hanging over his arm. Very little is known about the life of St. Clement (92-101 AD). According to the oldest list of Roman bishops, he was the third successor to St. Peter in Rome. St. Clement converted many high-ranking citizens of the region before being exiled to Crimea by emperor Trajan. There, with the charisma of miracles, he converts several thousand to Christianity. 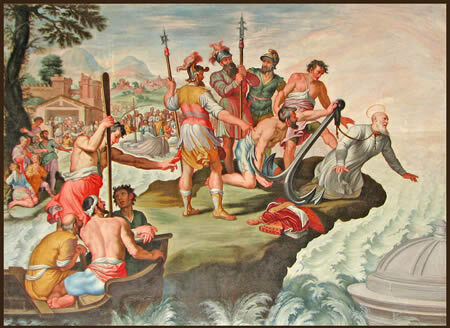 Learning of this, Trajan condemns Clement to death by drowning him into the sea with an iron anchor. About the year 868 A.D., St. Cyril recovered some human bones and an anchor which he believed to be the relics of St. Clement. He took these relics to Rome where they were joined with relics of St. Ignatius of Antioch at the basilica of St. Clement in Rome. His feast day is November 23. The dejected Phocus later learned that Agnes was a Christian and denounced her to his father. Sempronius questioned her officially, and she freely admitted her faith in Jesus. He ordered her to go the temple of Vesta, to offer her a sacrifice but Agnes steadfastly refused any compromise with pagan practice. Threats of death also did not sway her (some sources indicate that Roman law did not permit the execution of virgins), so the judge threatened her chastity instead. Agnes was stripped naked and dragged through the streets to a brothel. 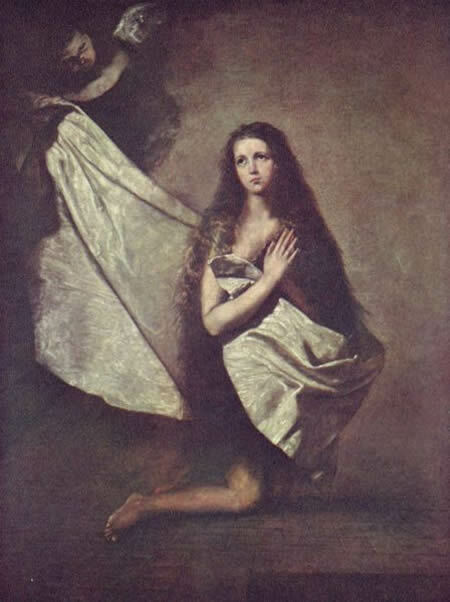 On the way, as the saint prayed, her hair miraculously grew and covered her body to protect her modesty. According to the legend, at the brothel, she managed to remain a virgin. She was then condemned as a witch and led out tied to a stake to be burned. However, the bundle of wood would not burn, whereupon the officer in charge drew his sword and struck off her head (or stabbed her in the throat). The execution reportedly shocked even the bloodthirsty pagan crowd, since Agnes was so young and pure. Thus, her death created a new wave of sympathy for the Christians and brought many to the faith. Her feast day is celebrated on January 21. 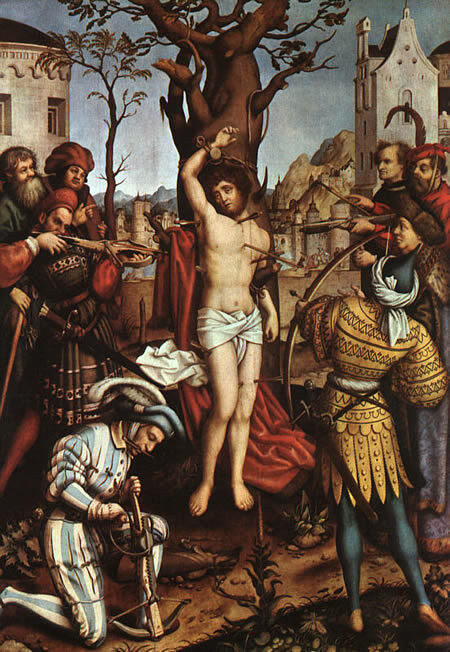 There are few saints who exerted such a powerful hold over the artistic imagination of fifteenth-, sixteenth-, and seventeenth-century Europe as St. Sebastian. He was an officer of the Imperial Roman army, and captain of the guard under the emperor Diocletian in 3rd century AD. During Diocletian's persecution of the Christians, Sebastian comforted Christian prisoners and used his position to convert soldiers and a governor to Christianity. Discovering his betrayal, Diocletian ordered Sebastian to be shot by archers. He survived, recovered, and returned to preach to Diocletian, who had him beaten to death. He died a martyr in Rome, c 288 AD. Because Sebastian was thought to have been killed by the arrows, and yet was not, and then later was killed by the same emperor who ordered him shot, he is sometimes known as the saint who was "martyred twice." Saint Catherine of Alexandria, also known as Saint Catherine of the Wheel was the daughter of Costus, governor of Alexandria. Having received a vision that urged her to baptism, Catherine became a Christian. It is said that she visited her contemporary the Roman Emperor Maxentius and attempted to convince him of the error of his ways in persecuting Christians. She succeeded in converting his wife, the Empress, and many pagan wise men whom the Emperor sent to dispute with her, all of whom were subsequently martyred. 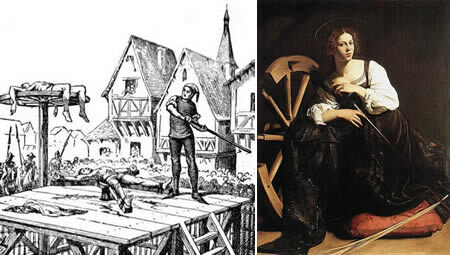 Upon the failure of the Emperor to win Catherine over, he ordered her to be put in prison; and when the people who visited her converted, she was condemned to death on the breaking wheel (The wheel was typically a large wooden wagon wheel with many radial spokes, but a wheel was not always used. In some cases, the condemned was lashed to the wheel and beaten with a club or iron cudgel, with the gaps in the wheel allowing the cudgel to break through). According to legend, the wheel itself broke when she touched it, so she was beheaded. Given the paucity of historical information, however, there is very little evidence to confirm any of these legends. 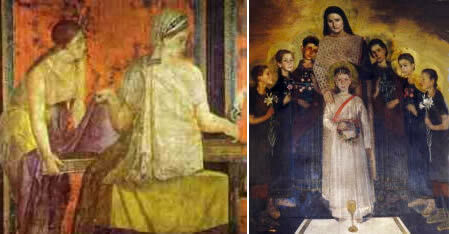 Her feast day is celebrated on 25 November by most Christian churches. Symphorosa was a lady living at Tibur, mother of 7 children and the widow of the tribune, Getulius. When Emperor Hadrian had completed his costly palace at Tibur and began its dedication by offering sacrifices, he received the following response from the gods: "The widow Symphorosa and her sons torment us daily by invoking their God. If she and her sons offer sacrifice, we promise to give you all that you ask for." When all the emperor's attempts to induce Symphorosa and her sons to sacrifice to the gods were unsuccessful, he ordered her to be brought to the Temple of Hercules, where, after various tortures, she was thrown into the river (Anio), with a heavy rock fastened to her neck. The next day the emperor summoned her seven sons, and ordered them to be tied to seven stakes, which had been erected for the purpose round the Temple of Hercules. Each of them suffered a different kind of martyrdom. Crescens was pierced through the throat, Julian through the breast, Nemesius through the heart, Primitivus was wounded at the navel, Justinus was pierced through the back, Stracteus (Stacteus, Estacteus) was wounded at the side, and Eugenius was cleft in two parts from top to bottom. Their bodies were thrown into a deep ditch at a place which the pagan priests afterwards called "Ad septem Biothanatos." (The Greek word biodanatos, or rather biaiodanatos, was employed for self-murderers and, by the pagans, applied to Christians who suffered martyrdom). The Church celebrates their feast 18 July.